What’s all the fuss? He only reigned 9 years – from 1332 B.C. to 1323 B.C. – and he was a teenager. 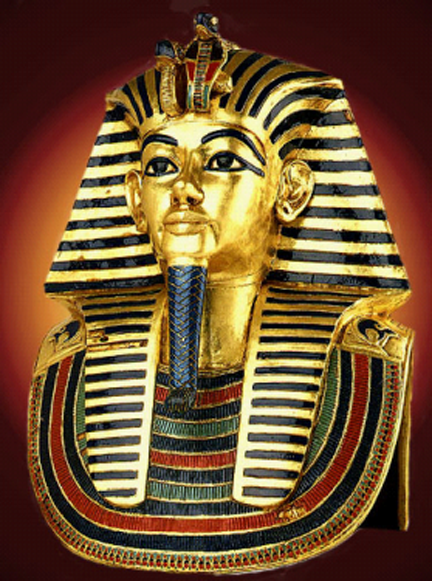 Ask anyone to name a Pharaoh of ancient Egypt and the answer will probably be: King Tut. We call him Tut because we can’t pronounce Tutankhamun, let alone spell it. To add confusion, his birth name was Tutankhaten, son of King Akhenaten. Akhenaten was very unpopular because he changed the religious and political practices of Egypt during the time of his reign. Over the years, Akhenaten became more autocratic and his regime more corrupt. Following a 17-year reign, he was gone – probably forced to abdicate – and died soon after. His 9-year-old son, Tutankhaten, took over around 1332 B.C.E. He immediately changed his name to Tutankhamun to distance himself from his father. The new Pharaoh returned to traditional ways in the belief that the Gods would look kindly on the restored holy sites and practices. The 9 year-old King married his 13 year-old half-sister, Ankhesenamun, the daughter of Akhenaten and Nefertiti. The new Pharaoh and his wife had two daughters, both died at birth. The idea that a 9 year-old could run a kingdom is a bit of a stretch and it is assumed that there were powerful advisors who made the decisions and had the King issue the orders. There is evidence to believe that life went smoothly during his reign, with the exception of a few minor wars. Relations were reestablished with the neighboring countries and there was peace within Egypt. Tutankhamun was a minor figure in ancient Egyptian history. For 3,000 years his name was seldom mentioned. How then, is it that his name is the first name mentioned today? His tomb was discovered in 1922 by a team of British archaeologists who had been researching and digging for the previous 30 years. The story of King Tut was inscribed on the inside pyramid walls and the burial room was filled with gold, gems, ebony and various oils. Preserved over thousands of years was the mummy of King Tut. Even though he died at age 19, his body showed signs of trauma. He had broken bones – perhaps from the fall from a horse – as well as evidence of malaria and gangrene. Following the death of King Tut, his wife, Ankhesenamun, married the new Pharaoh, Ay, who had been a chief advisor to Tut and his father. Speculation is that the marriage was against her will. Shortly after the marriage, history has no record of her, and she is not mentioned in the tomb of Ay. He ruled only a short time, and after his death, Horemheb became Pharaoh. He took action to erase all mention of Akhenaten, Tutankhamun and Ay. Thus, history was robbed of more information about this period. The legacy of the teen-king Tutankhamun was brought to the world stage by exhibits that have been made available to a curious public. Ordinary citizens have been given the opportunity to have a glimpse at a royal life and an almost unknown decade of history.